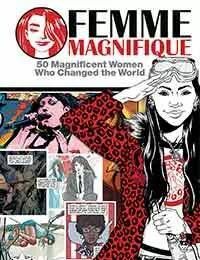 Fifty female trailblazers of yesterday and today get a four-color sequential tribute in Femme Magnifique. This collection features three-page short stories about women from the arenas of pop music, politics, art, and science. From astronauts and archaeologists to muckrakers and mathematicians, Femme Magnifique will stimulate and educate. Part mini biopic, part personal inspiration, this collection also features new material including a foreword by Cindy Whitehead, behind-the-scenes process pages, and more! Creators from South Africa, India, England, Denmark, the U.S. and other locales converge to share stories of personal heroines Kate Bush, Octavia Butler, Rumiko Takahashi, Ada Lovelace, Misty Copeland, Margaret Sanger, Michelle Obama, Sally Ride, Harriet Tubman, and more! Comic book luminaries Gail Simone, Kelly Sue DeConnick, Bill Sienkiewicz, Kieron Gillen, Sanford Greene, Jill Thompson, Gilbert Hernandez, Gerard Way, and Marguerite Bennett, to name a few, lend their talents to a celebration of kickass women who are truly magnifique.